The government of India (GOI) is continuously promoting AADHAAR card like single identity number in other countries. This will work as proof of identity as well as proof of address. 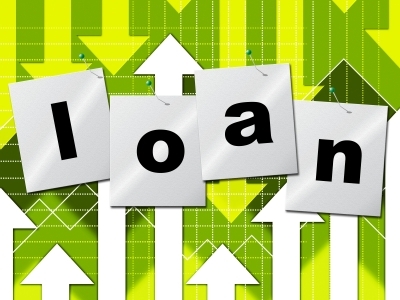 It is also used to transfer the government subsidies to the bank account directly. Recently Government is also pushing to link the AADHAAR number with EPF number, Bank account number, LPG ID number etc. GOI is giving extra benefit if you link the AADHAAR number with EPF account number such as you can easily withdraw your PF amount. That’ why it is become really necessary to link AADHAAR to bank account. Recently, Income Tax department has made it mandatory to link your PAN card to AADHAAR card and you must quote the AADHAAR number while filing Income tax return. How to add AADHAAR Card to Bank account? 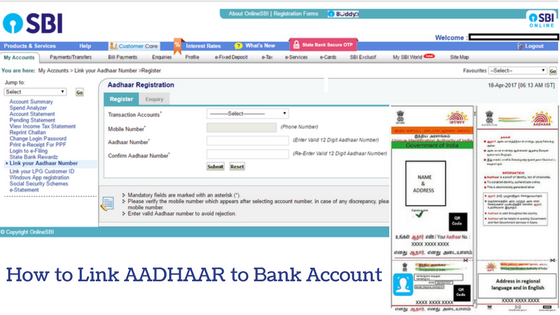 You can link the AADHAAR number to the bank account by both the ways i.e. online and offline. Log in to the Internet Banking facility of your account. If you don’t have internet banking facility, you can start the facility by visiting your branch and fill up a form requesting internet banking facility. Some banks have also the facility of generating internet banking password with the help of customer id, debit card number, and other details. Click on the update other card details button. Put the 12 digit AADHAAR number. Click on submit the details. After the verification by the bank, your account will be linked with the number and you will get a confirmation SMS from the bank. Download the AADHAAR number seeding form from the bank website. Submit the form along with the AADHAAR card photo copy by visiting the bank branch. The bank official will verify the number with the original copy of AADHAAR card. Finally, bank official will update the details and you will receive an SMS after successful updating of account. The bank is also sending the SMS requesting to link the AADHAAR number by sending an SMS with the number to a special number authenticated by the bank. 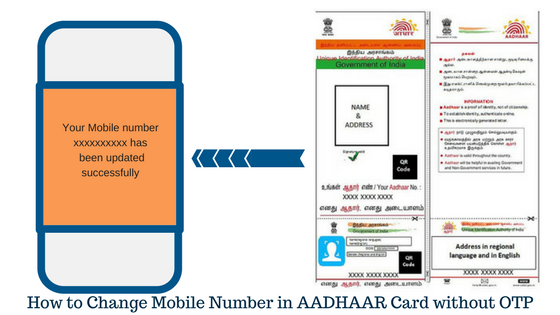 You can also link the ADHAAR number by visiting an ATM nearest to you. Some of the banks have started the facility of updating the AADHAAR number through the ATM also. In this regard, remember that during taking the benefit of LPG subsidy process, many individuals have done their AADHAAR number linked to the bank account. But those who did not can do the same right now even if you are not taking the subsidy. So, how can you know that your AADHAAR number is already linked to the bank account? If you have multiple bank accounts and already linked your AADHAAR to some bank account. You forget the account which are already linked and which accounts are to be linked. You can check the following steps. Put your AADHAAR number and Captcha provided. You will receive an SMS stating OTP in your registered mobile number. After authorizing the OTP you will know the bank account number which is already linked with AADHAAR. You can check alternatively on your mobile also. You can visit the bank branch personally and always ask whether the AADHAAR number has already been linked with the account or not. If your AADHAAR card is with incorrect details, you can update the details online. If you have a query related to EPFO, link the AADHAAR number with the EPF account. 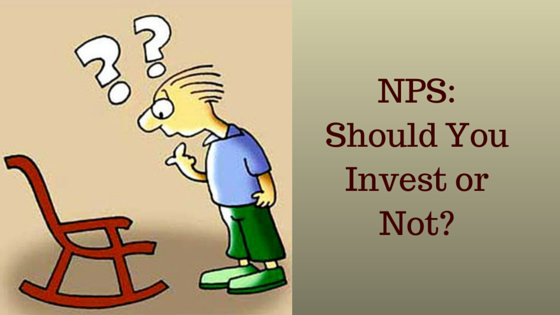 It will also help to withdraw the PF amount from the EPFO easily with minimum effort. Digital Life certificate – The pensioners have to submit the life certificate to the bank pension account for their continuity of pension. The AADHAAR number enables a pensioner to have the digital certificate which ensures the direct transfer of pension to the pension account. AADHAAR enabled Payment System (AEPS) – This is a micro-ATM based payment system developed by NPCI. This is also called as AADHAAR enabled payment system (AEPS). This will change the entire payment system across the country if it is implemented properly. Already, it has been used at some ration shops to pay at the shops and the subsidies are directly transferred to the bank account. The government is pushing the AADHAAR card in every step in your life. If you have not updated the AADHAAR number to your bank account, you may face some issues regarding the service and benefit of government subsidies etc. So, don’t wait and link tour AADHAAR number to the bank account.